one of 10 outstanding summer books"
Canadians have a romantic image of the painter Tom Thomson as a solitary individual, paddling alone through the wilds of Ontario, vigorously sketching scenes from nature that he would convert into large oil canvasses at his Toronto studio—a man thoroughly, even exclusively, dedicated to his art, totally immersed in the creation of what have become iconic images of the Canadian landscape. And so much is true, except that he seldom travelled alone and he occupied himself with rather more than just sketching on those trips. He fished, hunted, picked berries and other wild edibles, had long conversations, and even longer silences in the deep summer nights. And one more thing, he was rather good at making doughnuts. Yes, doughnuts. While camping in the wilds of Algonquin Park, no less! And in social settings, he was also an avid dancer and versatile musician, hardly a wallflower. That’s all very well, one might say, but what on earth do doughnuts and dancing, etc. have to do with Thomson’s art? 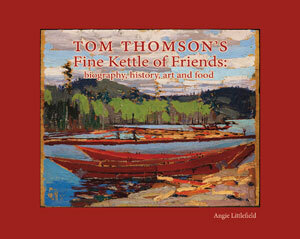 Actually, as Tom Thomson’s Fine Kettle of Friends shows, they had a lot to do with it. Plenty has been written about Thomson’s drawings and paintings as such. He is regarded as a luminary of the Canadian art world, despite having drowned at the age of 39, still early in what was promising to be a stellar career. Difficult to categorize, his brush technique and use of bright, vibrant colours give his work a post-impressionist feel, and his influence on painters in the famous Group of Seven was considerable. But he himself is often portrayed simplistically as a back-to-nature loner. This is very far from the truth. Our image of Thomson needs a makeover, and this book aims to do just that. The premise of Thomson’s Fine Kettle of Friends is that family, friends, and, yes, food and its preparation had a nurturing influence on Thomson’s budding talent. Author Angie Littlefield presents the important relationships in Thomson’s life: first his family, particularly his siblings, then the friends who were important at each stage of his development as an artist, among them Ernest Thompson Seton and even one Archie Belaney, later better known as Grey Owl. Interspersed among these discussions are recipes. Why recipes? From an early age, Thomson was an adept and enthusiastic cook, and he was often at the center of preparation or choosing of meals for dinners and social functions. Littlefield’s extensive research has gleaned much information on food from letters of Thomson and his social sphere, but she goes further, reproducing recipes from cookbooks of the period to show what types of food were available and what food preparation at the time looked like. Squirrel, rabbit, pigs lips, bannock, dandelion, chop suey, Mulligan stew, beefsteak pie, and, yes, doughnuts. All of this conveys a deeper picture of Thomson’s zest for life and goes part of the way toward fleshing out the deep sensuality that found its way into his painting. Thomson’s Fine Kettle of Friends also delivers something else. In this year of Canada’s 150th anniversary, Thomson can be seen as more that just a recorder of Canada’s natural beauty and an influential artist. Born in 1877, not long after Confederation, Thomson was an active player in Canada’s forging of new, independent identity for itself. Like most of Canada at the time, Thomson had roots on the farm, but his ambitions took him to the city. It was in Toronto that he started his career, but it wasn’t until he went back to the land, specifically the wilds of Algonquin Park, that he found the last element needed to let his full artistic passion bloom. In his work we see thus a merging of old and new, temporal and eternal. So it is with Canadians’ sense of themselves. Canada and Canadians should always be on the cutting edge of progress and modernity, as Thomson was in his art. But as Thomson learned, the connection with the land itself must always be nurtured. For it nurtures us. “I very much enjoyed reading the text. It is full of interesting tidbits on Thomson’s early years and working his life around recipes is great fun.” Charles Hill, former National Gallery of Canada Curator of Canadian Art. “Utterly enjoyable reading! The people and places in Tom Thomson’s life come alive in Littlefield’s richly detailed stories. Truly fabulous.” Nancy Lang, researcher and co-producer for White Pine Pictures’ West Wind: The Vision of Tom Thomson. “I enjoyed the tasty outing with Thomson and Edgar Burke’s family on Fairy Lake including a too brief visit with an austere Winnifred Trainor.” Neil Lehto, author, Algonquin Elegy: Tom Thomson’s Last Spring. “It is appropriate that Littlefield devotes an entire chapter to Minnie, Tom’s favourite sister. No wonder that Tom, an adventurer himself, favoured this feisty girl who plundered her dowry to enrol in college, studying classics, language, music, art and more – and stuck to it for three years, eventually marrying (after some consideration) at age 32. The accounts of Tom and Minnie’s outings give a deep sense of their affection for each other, and their delight in the ‘delicious food’ served at Tom’s favourite McConkey’s on King Street.” Amanda Hale, author, In the Embrace of the Alligator, Sounding the Blood, My Sweet Curiosity and The Reddening Path. “I’m very impressed with the Archie Belaney chapter: a mix of document-based information with open speculation in a way that is quite compelling. Dennis Reid, author, A Concise History of Canadian Painting, editor, Tom Thomson. “What struck me was the amazing mobility of the Thomson family and their friends. They were peripheral, or central, to so many endeavours in our young country. Ms. Littlefield has shown us life in early Canada with a much richer palette than we might have imagined. Do join us for dinner!” Ruth Abernethy, sculptor and author of Life and Bronze. “Angie Littlefield has brought it all together: Tom Thomson, his history and his life; food and how it used to be and how it brought people together—and Canada with its history, everyday life and spelling. Finally, it’s not cutting out letters to save money by using American spelling. This book shows through people and food who we are, because of where we came from.” Rebecca Middleton, editorial researcher White Pine Pictures, including West Wind: The Vision of Tom Thomson. “I am very impressed with your latest Tom Thomson presentation and offer my humble comments on the outstanding research and writing. You have, again, advanced my writer’s inferiority complex. Your book is a real masterpiece with in-depth research and outstanding pictorial support!” Robert Lavack, Sweden/Canada, author of “Flying high with Morrisseau”, The Morrisseau Papers, Nun of That and “sometimes war chooses you”. “This lively book will give the reader a vivid sense of Tom Thomson as a personality beyond his art. Thomson’s friendships, in particular with the colourful J.W. Beatty, are wonderfully evoked.” Amy Furness, Rosamond Ivey Special Archivist & Head, Library & Archives, Art Gallery of Ontario. “What a wonderful book! It has been a real delight to read. Regardless of how familiar you might feel you are with Tom Thomson and his life, there is a freshness to how Angie Littlefield tells the story. Anyone interested in Thomson, early 19th century life or cooking will definitely enjoy this book.” Virginia Eichhorn, Director & Chief Curator, Tom Thomson Art Gallery. “This engagingly written book presents well researched narratives that enhance our understanding of Tom Thomson through facts and possibilities concerning his life. A good example is H.B. “Harry” Jackson accompanying Tom on his first visit to Algonquin in May 1912, a trip which was the initial spark in Thomson’s intense artistic love affair with the Park.” Ron Tozer, Algonquin Park Naturalist (retired) and author of Birds of Algonquin Park. The great Canadian painter Tom Thomson is often seen as a solitary man: just him in his canoe on some remote northern Ontario lake with only his fishing pole and art supplies to keep him company. But as author and curator Angie Littlefield points out in her recent book, Tom Thomson’s Fine Kettle of Friends: biography, history, art and food, that image is a narrow view of one of Canada’s iconic artists; it’s time, she writes, to “make room for new images.” READ MORE HERE!